Most investors are aware of some of the deductions they are entitled to; for example, they know they can claim their Property Manager's fees, council rates and any repairs and maintenance costs. However, all too often investors are unaware of property depreciation and as such they frequently miss out on the valuable returns these deductions can provide them with when they complete their annual income tax returns. To help investors maximise the deductions they can claim from an investment property, let's look at some key points to help you understand depreciation. Over time, any building and the assets contained within it will experience wear and tear. Legislation allows the owners of any income producing property to claim this wear and tear as a tax deduction called depreciation. Unlike other expenses involved in holding a property, such as repairs and maintenance for instance, an investor does not need to spend any money to be eligible to claim it. For this reason, depreciation is often described as a non-cash deduction. The capital works allowance refers to what an investor can claim for the wear and tear that occurs to the structure of the property. This includes any structural improvements that may have been made during a renovation. As a general rule, any residential building where construction commenced after the 15th of September 1987 will entitle their owner to capital works deductions at a rate of 2.5 per cent per year for up to forty years. Owners of older buildings constructed prior to 1987 should still find out what deductions are available, as often these buildings will have undergone some form of renovation which can result in capital works deductions for the owner. Plant and equipment depreciation* on the other hand, refers to the deductions an investor can claim for the wear and tear that occurs to the easily removable fixtures and fittings found within the property. There are more than 6,000 different assets recognised by the ATO which an investor can claim depreciation deductions for. Some examples include the carpets, blinds, air conditioners, hot water systems, smoke alarms and ceiling fans. Unlike structural items, no date restrictions apply when claiming depreciation on plant and equipment assets. Each of the assets is assigned an individual effective life and depreciation rate by which depreciation should be calculated. Who should you contact to calculate and maximise your deductions? Often an investor will make the mistake of thinking their Accountant will claim all of the deductions available in their investment property. When it comes to depreciation, however, it is important to consult an expert in this area. Legislation recognises Quantity Surveyors as being one of a few select professionals with the knowledge necessary to estimate construction costs for depreciation purposes. A specialist Quantity Surveyor will use their skills to provide a depreciation schedule that outlines the deductions an investor can claim for any specific property at the end of each financial year. An Accountant will then use the figures outlined in the depreciation schedule when submitting the investor's individual income tax return at the end of financial year. How will depreciation help an investor? The additional funds an investor receives by claiming depreciation can have a significant impact on their available cash flow. On average, an investor can claim between $5,000 and $10,000 in depreciation deductions in the first full financial year. For obligation free advice on the deductions that are available for any investment property, contact the expert team at BMT Tax Depreciation on 1300 728 726. Fake MYOB invoices land in thousands of email inboxes, as business owners warned "never click on the link"
Business owners have once again been reminded to be on the lookout for suspicious emails, after thousands of fake invoices impersonating accounting company MYOB started hitting inboxes this week. 30 June 2017 is fast approaching. Sammut Bulow are providing you the below tips to assist you in minimising your tax payable in the 2017 financial year. Sammut Bulow can also prepare a tax estimate and more customized recommendations to assist you in minimising your tax payable. We recommend contacting your Sammut Bulow accountant to discuss your tax planning options. Small businesses can immediately deduct assets costing less than $20,000. If you are considering buying an asset in the next couple of months, we recommend you consider making the purchase and installing the asset for use prior to 30 June 2017. This immediate deduction is only available up to 30 June 2017. If you are looking at buying any assets under this value then now may be the time to buy to maximise your tax savings. NOTE – It is always important that you only purchase assets required in the business. Business and personal cash flow and financing should also be considered. Maximising your superannuation contributions prior to 30 June 2017 can help reduce your tax payable. Your superannuation fund needs to receive the contribution by 30 June 2017 for you to receive the deduction this year. Small businesses can claim a deduction for future expenses prepaid before 30 June 2017. You can maximize your 2017 tax deduction by bringing forward payment of expenses to June 2017. We recommend you review your trade debtors at 30 June 2017 and assess whether any of the debtors are no longer collectible. If they are no longer collectible, the trade debtor can be written off as a tax deduction and claimed in the 2017 year. To be considered a bad debt, you must have made a reasonable attempt to collect the trade debtor. This can include sending reminder notices or calling the trade debtor to request payment. For large debts, the services of a debt collector may need to be engaged prior to writing of the debt as bad. Employee superannuation is only deductible when the contribution is actually made. We recommend paying your employee superannuation for the June 2017 quarter before 30 June 2017. This will allow you to deduct the superannuation contribution in the 2017 year. Where possible, defer issuing invoices until after 1 July 2017. This will allow you to defer recognizing the income in your tax return until the 2018 financial year. If you operate your business through a company and you have a current Division 7A loan with the company, we recommend ensuring you have met your obligations prior to 30 June 2017. This includes making the minimum repayment where appropriate. Failure to adequately address your Division 7A obligations could result in a deemed dividend being paid to the shareholder. This will be taxed at your marginal rate without any franking credits. If you have a Division 7A loan, we recommend contacting your accountant to discuss what actions are required prior to 30 June 2017. If you have sold any capital asset during the 2017 year you may have made a capital gain. This can result in additional tax payable when we lodge your income tax return. If you have sold a capital asset, we recommend contacting your Sammut Bulow accountant to discuss your tax options. Alternatively, if you are planning on selling an asset, we recommend you consider delaying signing the contract until after 1 July 2017 to defer the capital gain until the 2018 financial year. Affected by Cyclone Debbie or ex-Cyclone Debbie? We'll give you time to deal with your immediate problems first, and we can help you sort out your tax affairs later. income tax returns due 31 March 2017 deferred to 30 April 2017. Please be aware that one of our clients have received another Scam email from ASIC regarding the renewal of their business name. Please take a look at the below - This was the scam email received. - You will note the subject only says "Renewal" You will never receive it like this. The Subject line will always have "Renewal: ERINS ACCOUNTING"
- SCAM email states in first sentence "Please find information in the following link regarding the renewal for your company"
- It SHOULD be "Please find information in the following link regarding the renewal for ERINS ACCOUNTING, registration due date 16/04/2017"
If you have any queries, please do not hesitate to contact this office. For anyone who wants a comfortable retirement, 1 July 2017 is a very important date, as this is when the majority of the government's proposed super changes are likely to come into effect. Although it seems like super is constantly under attack, it is still the most effective way to provide for retirement. It remains a tax-free retirement option, and the only legal way to ensure you pay no tax on 'decent' retirement incomes. In fact, super is so good that the government is looking to reduce how much we can use it. One way they are doing this is by reducing the contributions you can make. Among the various proposals is a significant restriction on Contributions. After-tax personal contributions, will be lowered from $180,000 to just $100,000 a year from 1 July 2017^. If you're under 65 you can use the bring forward rule which means you could add up to $540,000 of after-tax contributions this financial year, which then covers a 3 year period. After 1 July 2017, if you're under 65 the annual after-tax contributions cap will drop to $100,000 so the maximum bring forward rule will then be $300,000 (transition arrangement applies) ^. Before-tax caps will reduce from $35,000 – if you're 50 and over – or $30,000 if you're currently under 50 – to a blanket $25,000 per year regardless of your age. If you're between 65 to 74 you still need to satisfy the work test. Make the most of this window of opportunity now! Thankfully, a window of opportunity still exists for you to move large sums into your super. While the current rules are still in place, it is possible for a couple to put over $1 million into super. Once the rules change, this opportunity will be lost forever. So now is the time to act. With only months until this change becomes law, urgent action may be needed before this opportunity is lost forever. ^ As different caps will apply over different years you may want to consider getting financial advice about these transitional arrangements. If you have super balance of over $1.6 million you will not be eligible to make any after-tax contributions. 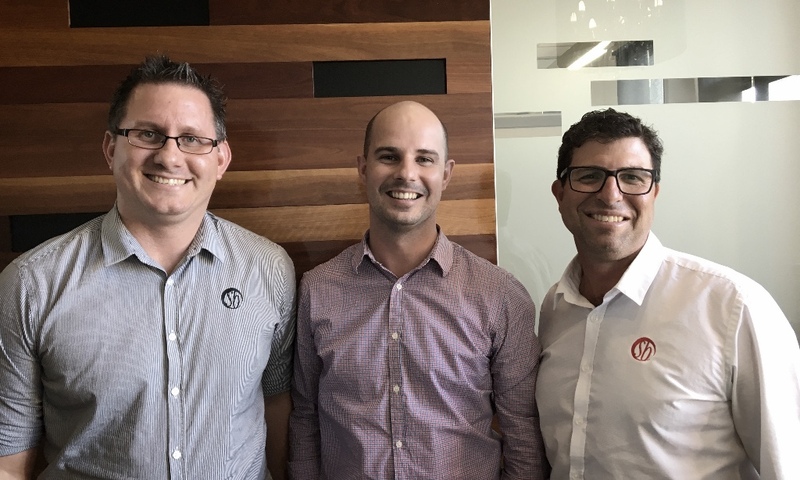 Martin Sammut and Brad Bulow are proud to announce Daniel Riggs (Danny) as a new Partner of Sammut Bulow. Since joining the company Mr Riggs has had a significant impact on the team and overall growth of the firm. Sammut Bulow's values are an integral part of the company and Daniel has demonstrated his agility and honesty, time and time again, through the development of client solutions and his leadership. This is an exciting time for Sammut Bulow, we hope that you will join us in congratulating Daniel on his accomplishment. Our company has seen significant changes over the last few years, and we look forward to a stronger future with the latest addition to our leadership team. We are proud of our team, love our clients and look forward to another great year. I was recently going through some old photo albums and came across some photos of myself in the 80s, sporting a classic mullet hairstyle and wearing a pink, green and yellow fluoro shirt. It immediately made me think of negative interest rates. It may seem a bit of a stretch, but there are some phenomena we get caught up in at the time, only to find ourselves looking back years later and asking, "What were we thinking?" This tends to be the nature of financial market bubbles, with probably the quintessential example being the 'tech bubble' of the late 90s, where the valuation of companies bore no semblance to their future profitability. Companies with no revenues and massive expenses were trading at ridiculous prices, with analysts and market participants inventing new metrics, in a vain effort to justify what was going on. After the inevitable happened and reality (and sanity) returned, those same market participants looked back, and with the benefit of hindsight, acknowledged that the price movements didn't make sense and should never have happened. In the end, the only way people were going to profit from investing in these companies, was to sell them at a higher price to someone else prepared to pay an even more ridiculous price – in other words, to find a bigger fool. As bubbles form and continue to gain momentum, this can be a very successful and profitable strategy, but it can be brutal on those left holding the can, when there's no one left to pay a higher price. While not as crazy as the tech valuations, the concept of negative interest rate policy is something we will need to look back on to understand the true impacts and consequences it has had. Negative interest rates are not completely new. In Switzerland during the 70s, negative rates were used to stop the rapid appreciation of the Swiss franc, as investors sought to avoid inflation in other parts of the world. What is new however, is the widespread occurrence of negative interest rates across Europe and in Japan, with a third of global government debt (about $7 trillion worth)1 now having negative interest rates. This means that investors are effectively paying to keep their money with the bank or to lend money to a borrower. As a real world example, imagine if you could get a car lease at a negative finance rate. You could turn up to the dealership, drive away a brand new car, return it years later at the end of the lease and receive a payment from the car yard! I'll take a Bentley Continental GT please, one of the convertibles! Why would they do this? Quite simply, they wouldn't! But investors, it seems, are expecting economic stagnation, and ultimately deflation for an extended period of time. However, while not exactly racing along, the data for global growth doesn't really support quite such a bleak outlook. In January, the World Bank downgraded its 2016 growth forecast to 2.4%, from the previous 2.9%. Despite problems in Europe and emerging markets such as Brazil and Russia, China is still projected to grow at 6.7%2 and the US at 2%3. So if we're not likely to get a deflationary environment, the only thing left for buyers of bonds with negative rates to have a positive return, is for them to find a buyer for those bonds at an even more negative interest rate – a bigger fool. A period of stronger than expected global growth and an uptick in inflation, should it occur, will mean that the buyer is unlikely to appear, and we'll see an end to the bond bubble that has grown over the past decade. Should this occur, the massive capital appreciation we've seen in the bond market will reverse, and we'll get a normalisation of interest rates along the yield curve. So make sure you've locked in the interest rate on your Bentley – those things are expensive! WARNINGS AND DISCLOSURES: This material has been prepared for general information purposes only and not as specific advice to any particular person. Any advice contained in this material is General Advice and does not take into account any person's individual investment objectives, financial situation or needs. Before making an investment decision based on this advice you should consider whether it is appropriate to your particular circumstances, alternatively seek professional advice. Where the General Advice relates to the acquisition or possible acquisition of a financial product, you should obtain a Product Disclosure Statement ("PDS") relating to the product and consider the PDS before making any decision about whether to acquire the product. You will find further details of the service we provide and any cost to you within the Financial Services Guide. Any references to past investment performance are not an indication of future investment returns. Prepared by EP Financial Service Pty Ltd ABN 52 130 772 495 AFSL 325 252 ("Elston"). Although every effort has been made to verify the accuracy of the information contained in this material, Elston, its officers, representatives, employees and agents disclaim all liability (except for any liability which by law cannot be excluded), for any error, inaccuracy in, or omission from the information contained in this material or any loss or damage suffered by any person directly or indirectly through relying on this information. Smart company recently listed the State Government Grants to help small business: 2016. We have just pulled out the Queensland options, this is not the complete list of all the grants available but when it comes to Business Grants, knowing where to start looking can be half the battle. The Ignite Ideas Fund is part of the Queensland Government's Advance Queensland initiative to support businesses across the state. Under this program, businesses can receive Tier 1 grants of up to $100,000 or Tier 2 Grants of up to $250,000 to go towards proving their business idea will work or identifying a market or investor for the product. To be eligible, businesses must: have fewer than 200 employees; be incorporated in Queensland; be registered for GST; demonstrate the idea can achieve high growth and create jobs; have a minimum viable product; and show support for the project from customers, industry partners or investors. Applications for the second round of funding under the program open on September 12. More information is available here. Also part of the Advance Queensland initiative, the Business Development Fund is aimed at businesses that are in the process of commercialising research or an innovative product or service. Businesses in need of seed, early stage or follow-on investment can receive between $125,000 and $2.5 million from the program if they can demonstrate the business will create new, skilled employment and is commercially viable. Applications are currently open and more information is available here. Businesses that wish to hire a graduate to work on an innovative project can receive up to $50,000 per project under this government scheme. The funding is intended to cover two-thirds of the project's costs, with the business required to cover the remaining one-third. To be eligible, businesses must have fewer than 200 full-time employees; have been operating for at least two years; have an ABN and be registered for GST; and be prepared to manage the project in collaboration with a university. Applications for the fifth round of funding will close on October 7. More information is available here. Children are staying at home longer (some well into their Thirties) and their Baby Boomer parents are paying for it. All parents strive to give their children the best opportunities and support they can, but somewhere in there we as parents have gone from providing opportunities to constantly providing hand outs. This trend of Adult children living with their parents is becoming 'normal' in Australia and while some parents are frustrated and exhausted from "waiting" for their child to move out, others are happy to provide a home for their child. Referred to as "failure to launch" children and Boomerang kids (a young adult who returns home after leaving), they are fast becoming typical in Australia and the Western World according to researchers. Why are adult children still at home? A lot of the time having your child live at home longer makes financial sense – as long as the child is contributing and paying their own way. However, sometimes parents are sympathetic to their children's needs and continue to provide financial handouts. This assistance can be damaging in the long term, inhibiting self-sufficiency and understanding of money. To avoid these issues, it's necessary to have a plan to help your children. Full Article can be found here ... Six ways to reduce your child's financial dependence.